"This dessert is SOOOO easy and delicious!!! All you need is 5 ingredients to make this! Cream cheese mixed with caramel then topped with toffee bar pieces and apples for dipping.. what is there not to love?" Mix together the cream cheese, sugar and 1/4 cup of the caramel sauce in a medium bowl. Spread onto a serving tray or a plate. 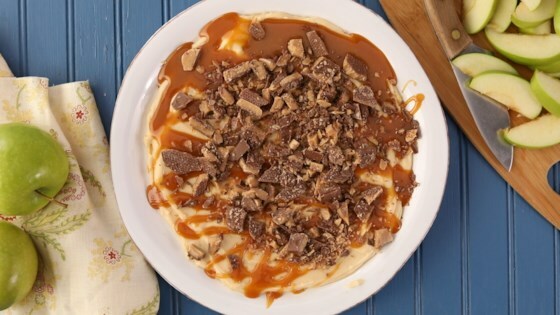 Drizzle the remaining caramel sauce over the top and sprinkle with pieces of chocolate covered toffee. Refrigerate for 30 minutes, then serve with apple slices. I see that I'm in the minority here, but this was WAY too sweet. It was like eating a bowl of sugar. If I made it again, I would cut way back on the amount of sugar. This was a super dessert that I used for a birthday party. It was gone in a flash and everyone wanted the recipe. I may try it with peanut butter and reese cups...yum!! Made this for our college night ministry. The best comment I heard was "Oh wow, it's like a party in my mouth!" I've only participated in eating this, and eating this, and eating this. Highly addictive so I am actually a little afraid of making it myself and only indulge at large gatherings.